Perrine Hamel and Leah Bremer offer insights from last month’s Resilience 2017 conference, which focused on setting a path for future research in global sustainability. You may have heard of the Anthropocene – the name for the current period in history dominated by human influence on the planet. But at the Resilience Frontiers for Global Sustainability conference last month in Sweden, Carl Folke, science director at the Stockholm Resilience Centre, said that a better term is “immature Anthropocene.” Folke used this phrase to remind attendees that humanity is really just starting to understand its impact on the biosphere. We have not yet found, however, how to use this knowledge as a global society to create large-scale transformative solutions that benefit both people and the environment. We are sharing here a few insights from the conference that resonated with the work that we are doing at the Natural Capital Project and the University of Hawaiʻi Economic Research Organization (UHERO). A good portion of our work focuses on the complex connections between society and the environment through the lens of “ecosystem services” – the multiple ways that people benefit from natural and human-modified ecosystems. Since we both grew up on islands – Reunion and Oʻahu, Hawaiʻi, we know that place matters. Even solutions to global problems like climate change require place-based solutions that are well-suited to the local cultural, economic, political and ecological context. We can talk about scaling solutions up, but we can’t forget that people often become good stewards of their environments because of their connections to and relationships with place. As Kate Brown emphasised in the opening plenary of the conference, humanity is part of life on Earth. We aren’t just linked to it. We are intertwined. And we are intertwined in places. While there are clear overlaps in research on resilience, sustainability and ecosystem services, there is value in defining each concept clearly. At the conference, we were reminded of a useful way of thinking about sustainability and resilience by Thomas Elmqvist and colleagues. In a recent paper, they defined resilience as a property of a system – in other words, human societies and natural ecosystems are constantly changing and can transform. That's in contrast to sustainability, which is a normative concept (i.e. being sustainable is good). As such, resilience may be a desirable or undesirable property (think about a resilient political system that promotes inequity and degrades the environment). In a similar manner, ecosystem functions can either be services or disservices to humans (think about mosquitoes breeding in a vegetated pond). Our work on both resilience and ecosystem services seek to improve understanding of such systems and how we benefit from them. We also need to accept some “fuzziness” in how we understand the world and the concept of resilience. “Real-world” practitioners, for example, might use different definitions for “resilience” than researchers: One participant at the conference described it as a “property, a process or an outcome.” As we’re still in the early stages of understanding resilience, we need to acknowledge that practitioners perceive resilience differently so that this concept serves as an opportunity rather than barrier to creating change. Another “grey” area is that of people perceptions and motivations to contribute to a more sustainable world. We need new epistemologies and ontologies to understand the world from the perspective of many different worldviews. Research based on quantitative data is one lens, but will rarely lead to transformation on its own, as Brigitte Baptiste from the Humboldt Institute in Colombia highlighted at the conference. She has proposed to “queer ecology” and move beyond the traditional scientific boundaries. M. Jahi Chappell also highlighted the historical problems with “apolitical ecology” – or the notion that science is apolitical – citing the injustices associated with colonial conservation as an example. Positive social transformation requires that we understand the critical role of power, trust and relationships in shaping how society works. Those studying problems of food security and biodiversity conservation need to be trained in the social and political sciences, not just the natural sciences. 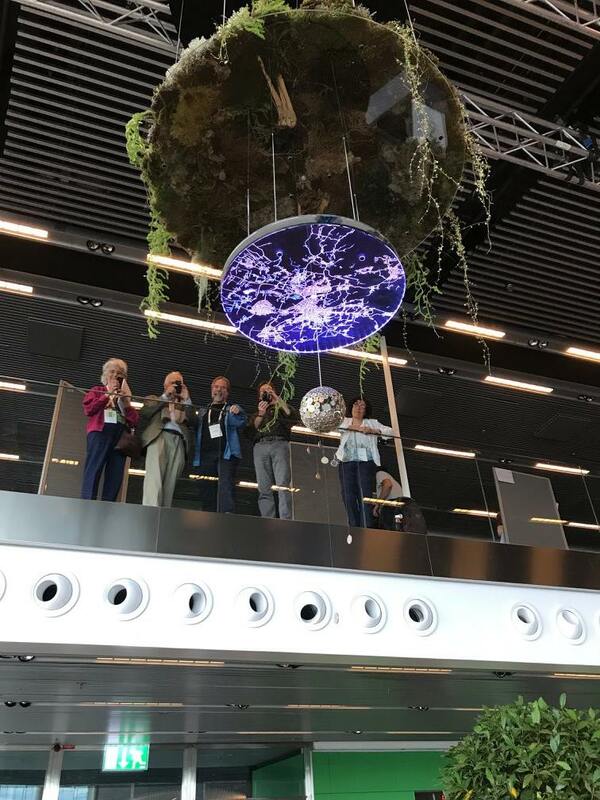 The conference highlighted the arts, from the remarkable sculpture by Tone Bjordam to the sci-fi images from the Radical Ocean Futures project and multiple dance and music pop-up sessions. Collaborations between artists and scientists are not new, but we see value in reminding ourselves that art is both a way to get different perspectives on our work and also to engage the public. Should we teach this to students? Martin Scheffer made a case for the merging of art and science at the conference. Teaching scientists to “lose time” and “loosen their brains” may help them to think up new and transformative ideas. While arts can inspire people, there are other ways to encourage the exchange of ideas among researchers and communities to foster positive change. A theme that received significant attention at the conference and follow up events is that of social innovation labs. These events, such as transformation labs or Sustainable Develop Goal (SDG) Labs, provide a space for researchers and practitioners to gain perspective on socio-ecological systems and seed innovative solutions. In practice, they bring a structured way to collect, debate, and process information on a given social-ecological system to redefine problems and opportunities for transformation. The ecosystem services and development communities have taken similar approaches through stakeholder engagement or design thinking processes, such as rapid prototyping workshops. As noted by many, transformation labs build on a rich history in design, but the increased focus on these experiments in recent years (for example in the context of SDGs) may help spread the good practices that they foster. We need a richer, more pluralistic framework to understand the multiple values that influence human behaviour and collective action. At the conference, Unai Pascual from the Basque Centre for Climate Change in Spain reminded us of the importance of considering “relational values” – those values that have to do with all forms of human relationships with each other and with nature. These can be both “instrumental” (a means to an end) and “held” values (such as a moral responsibility towards caring for the earth). It is these place-based relational values that inspire action and stewardship at local scales. We need to expand our empathy so that it covers both local and global issues and inspire people to act based on ethical grounds as well as for instrumental reasons. Finally, a recurring idea in the resilience, sustainability and ecosystem services communities is that of scaling. It comes in different flavors – scaling out, scaling deep, scaling up – and it is important for the scientific community to reflect on what “scaling good ideas” means. As one organiser of an SDG Lab focusing on green cities and based in Madrid put it, these labs allowed participants to scale deep, prompting them to think about questions from the viewpoints of their different selves: professional, citizen, parent and more. Many other projects, including some of the work we do at the Natural Capital Project, aim to scale out, such as by developing approaches and datasets that can drive change beyond an engagement in a particular place. There are myriad possibilities to scale our work – especially in this age of communication – and it is critical to think about what we want to spread: inspiration, collaboration, information or ways of thinking. The behavioural sciences will be key to address these questions, helping us turn a flap of a butterfly’s wings into a storm – or a simple tweet into an inspiring birdsong.